Xanview, the IoT SaaS platform for managing and monitoring physical security devices such as video surveillance cameras, alarms, access control, smart locks and other, raised an undisclosed amount in a round led by Bloc Ventures and Beacon Capital with the participation of Telefonica and the London Co-investment Fund. Xanview is your single place for security. Xanview has seen exponential growth since the launch of its platform two years ago securing clients such as the police, housing associations, retailers and restaurants. The investment will be used to expand the commercial team in response to the market demand for Xanview's platform and to continue investing in the product. David Leftley, managing partner at Bloc Ventures, and Maria Dramalioti-Taylor, managing partner at Beacon, will join Xanview's board of directors. Xanview is the first SaaS platform to enable security installation firms to manage their clients’ surveillance systems remotely while offering their clients enhanced functionality, including powerful monitoring tools that detect and alert on intrusion and potential system misuse. It is a “no brainer” for integrators – and their clients- to switch to,” said Maria Dramalioti Taylor. 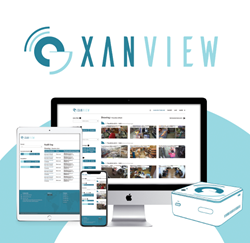 "Xanview has created a highly robust and innovative platform that addresses what we consider to be the biggest of customer and installer challenges, i.e. bringing together the latest innovations in IoT security with legacy systems in a cost effective and scalable manner. We think this is fundamental to the success of the physical security IoT market which will remain for many opportunities a mixture of new and old." said David Leftley. "Bloc and Beacon, with their experience in the security industry and SaaS, are ideal partners to help us scale the business and help our clients transform their businesses," said Roman Gaufman and Regina Shmerlin - Co- Founders of Xanview. "We're excited to have partners on board that provide us not only capital, but also vast strategic expertise." Xanview was founded in the UK in 2009 as a bespoke security solution for financial institutions and ultra high net worth individuals. Since then, Xanview’s team undertook an extensive R&D process to develop the solution into a single scalable and more secure platform for physical security devices such as video surveillance, alarms, ePoS, access control and other physical security devices. It is enjoyed by retailers, housing associations, hotel chains, police and many others. Xanview optimises usage, monitoring and maintenance by using its innovative integration engine and analytics. Xanview has unique security features that monitor for hacking, track all system access, unauthorized use and security system abuse. Housing associations easily monitor all locations and access to systems. Businesses can benefit from Xanview with real-time business information such as when its busiest and customer interaction. Security installers dramatically reduce unbillable support time with remote system monitoring and troubleshooting. They are also able to enhance their product offering with Xanview's cloud backup capabilities and notification services. Xanview integrates easily with existing systems, regardless of manufacturer or location. Bloc is an evergreen investment company, not an investment fund. It invests in early stage deep technology companies and has been designed and structured to identify and build on compelling investment opportunities to create long term value and mitigate risk for investors. Beacon invests in B2B enterprise technologies at pre-series A stage. Starting in 2012 as an angel syndicate (fka Angellab), Beacon has since invested in, and work with, some of the most talented entrepreneurs in the UK who transformed their industries. Beacon Capital is a partner of London Co-Investment Fund.